It’s no secret that the broadcast industry is changing—it’s changing, quite literally, in front of our eyes. From the quality of content to the platform we view it on, from the standards we follow to the methods we use to deliver content, the broadcast industry has never been in the midst of so much change at once. Tektronix engineer Ian Valentine discusses some key trends that are impacting the broadcast industry, and how Tektronix is helping customers adapt to the changes. “For the first time in decades, there’s a huge amount of change happening in the broadcast industry, all at the same time,” says Tektronix engineer Ian Valentine. At a high level, the broadcast industry can be grouped into two primary segments: The Content Creation segment including Acquisition, Production and Post Production, and the Content Delivery Segment, which covers both Linear and Streamed delivery of content to the home. It’s not just one or the other of these segments that’s in transition—there are big shifts occurring in both the Creation and Delivery of content. The first trend involves a shift from a point-to-point Serial Digital Interface (SDI) connection to an Internet Protocol (IP) connection for moving video around the facility and through Production processes. This switch presents a huge change for broadcast engineers, according to Valentine. One of the initial aims of converting to IP infrastructure is cost reduction of the broadcast infrastructure. At this early stage of the transition, those savings have not necessarily materialized yet. However, one advantage that IP offers is flexibility in both configuration of facilities and maintenance of the infrastructure as the industry moves towards higher resolution formats. As the predominant formats have changed from Standard Definition (SD) to High Definition (HD) to 4K and perhaps 8K in the future, broadcast engineers have had to update their internal infrastructure significantly, and deal with the associated costs. However, there’s a barrier to the IP transition in the form of evolving standards. From SMPTE ST 2022-6 and 2022-7 to ST 2110 and NMOS, broadcast engineers must be able to adapt as standards evolve. “I think that one of the things Tektronix has done a great job of is evolving as the standards have evolved. We have been proactive participants in the industry bodies and the associated interops. This means we have learnt about the challenges faced by our customers first hand, which helps us ensure they are protected as standards change and evolve,” says Valentine. Another major trend at the front-end of the process is the increasing use of wide color gamuts (WCG) and High Dynamic Range (HDR). This trend is different from past format transitions, such as monochrome to color, color to SD, and SD to HD, in that it’s driven less by consumer demand and more by the industry itself. Tektronix is working to overcome this challenge in several ways, according to Valentine. Tektronix also provides new measurements and tools to help with camera setup and balancing in HDR or mixed SDR/HDR environments. In the delivery segment, one major trend is a transition from linear delivery of content to what’s called over-the-top (OTT). In this particular case, high quality content is not carried along with other premium video or TV services, but is provided to the home “over the top” of your data services. In essence, this describes the transition from a traditional cable TV model to video streaming services like Netflix and Amazon Prime. One of the difficulties with delivering OTT content is that it must account for the available bandwidth of the end user. When the content is encoded, it must be broken up, or packaged, into small chunks (say every two seconds), each of which is then divided into profiles of varying resolution and bitrate. Stitching this all together as bandwidth varies for the end user is no easy task, as Valentine explains. Valentine explains that while Tektronix provides tools to check this alignment, there are other difficulties to deal with when delivering content OTT—for example, ensuring audio is delivered correctly, ad splice points are in the right place, and blacked out content (e.g. regional sports events) is done correctly, and most of this is done with encrypted content. 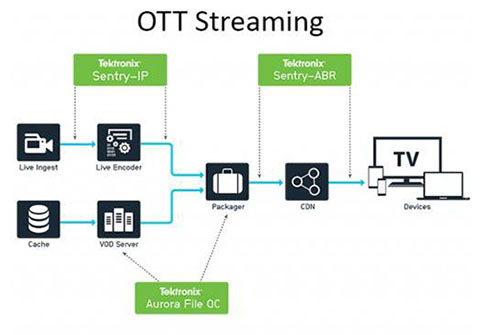 Since OTT content is encrypted before being sent to the end user, it can be difficult to monitor the actual quality of the asset and the user experience. The major trends impacting the broadcasting industry are diverse, covering both Content Creation and Content Delivery, and significant, requiring engineers to adapt to some big changes. The transition from SDI to IP , the increasing use of HDR and wide color gamuts, and the switch from linear delivery to OTT streaming present both challenges and opportunities.